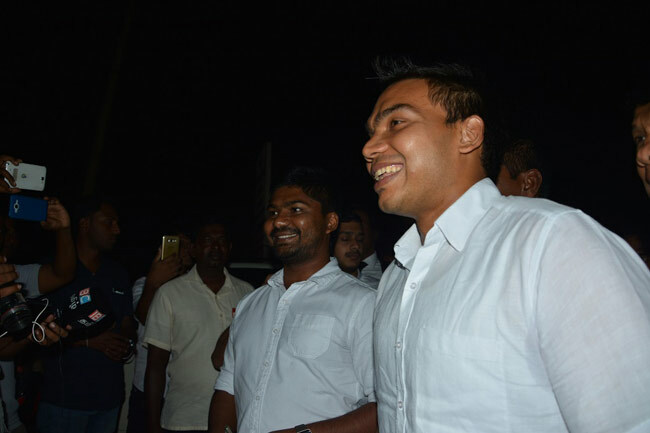 UPDATE: (11.04pm) - MPs Namal Rajapaksa, DV Chanaka, Prasanna Ranaweera, PC members Upali Kodikara, Sampath Atukorala and Ajith Prasanna have been remanded until October 16. UPFA Parliamentarians Namal Rajapaksa, DV Chanaka, Prasanna Ranaweera and 3 others have been arrested by Hambantota Police over the protest held in Hambantota on Friday, the Police spokesman said. Southern Provincial Council member Sampath Athukorala, former Western Provincial Council member Upali Kodikara and Major (Rtd.) Ajith Prasanna are the other three persons arrested by police. The politicians were arrested after they arrived at the Hambantota HQ Police for questioning regarding the protest staged on October 06. The three MPs were notified in writing to appear at the police station at 5.00pm today (10), however they had arrived only at around 7.15pm this evening. They have been arrested on charges of unlawful assembly, causing damage to public property, injuring police officers, obstructing their duty and violating a court order. Twenty-eight persons were arrested and remanded following the tense situation during the Joint Opposition-organised protest opposite the Indian Consulate in Hambantota last Friday (6). Police had used tear gas and water cannons to disperse the individuals engaged in the protest, against the agreement to handover operations of the Hambantota port and Mattala airport to two foreign companies. The protest was scheduled to be held near the Mattala Airport, however the venue was changed to Indian consulate in Hambanota after police had obtained a court order preventing any protests being held near the airport or in that jurisdiction. Provincial Council members Upali Kodikara, Sampath Atukorala and Ajith Prasanna were also summoned by police for questioning over the protest in Hambantota on Sunday (8).